Amazon and Netflix are the two biggest representatives of the streaming industry. They both produce proprietary movies and TV shows with great success and have a tremendous following all over the world. If you're into online streaming, Amazon's Firestick is one of the hottest options on the market for you. It's quite powerful (despite its size) and easy to set up, so even tech beginners can use it without any extra help. It's also very affordable and will unlock thousands of applications for you. Continue reading our comprehensive list of the best VPNs for Firestick if you want to learn more about the device and how to keep yourself safe and anonymous while streaming your favorite TV shows. 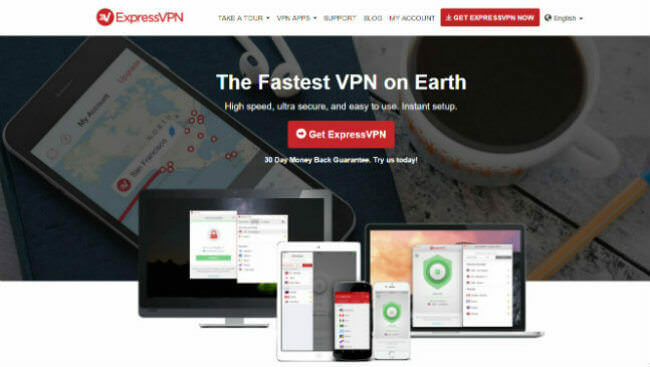 ExpressVPN is a respected VPN service famous for its fast connection speed. The company offers a perfect combination of security and speed in order to minimize connection throttle. NordVPN is an online security service that strikes a perfect balance between simplicity and complexity with its beginner-friendly interface and impressive portfolio of useful features. CyberGhost is a Romanian VPN provider launched back in 2011 as an unblocking service. The software comes with an app that provides your Amazon devices with a fully featured VPN functionality. PureVPN is all about keeping you as safe as possible while interfering with your connection speed as little as possible. The company also puts a big emphasis on Amazon's Firestick device. Super Sale SPECIAL!!! Get 70% OFF your 1-year plan! IPVanish is very easy to install on Amazon Fire TV Stick since it features a native VPN app on the Amazon App Store. Apart from this, it also offers a ton of security options and easily unlocks geo-restricted content. In order to understand Amazon Firestick, we first need to talk about Amazon Fire TV. This is a set-top video streaming device that introduced Amazon to the streaming market. Also called “the little black box,” the device supports 1080p and 4K HD video and provides its users with more than 15,000 apps, including apps for the biggest audio and video streaming services, games, and much more. Amazon Fire TV allows you to enjoy streaming services like Netflix, Hulu, Amazon Video, Showtime Now, DirectTV NOW, HBO NOW, and many more. If you’re an Amazon Prime subscriber, you’ll also have access to thousands of TV shows and movies via Prime Video and an impressive music catalog via Prime Music. Amazon Fire TV device is compatible with Alexa, allowing you to utilize the included Alexa voice remote to play games, watch videos, launch apps, listen to music or even order takeout. You’ll have universal search results from more than 140 channels, which will unify your search for games, apps, and video/audio content. Amazon Fire TV Stick or simply Amazon Firestick is a budget version of this device. It’s basically a USB drive-sized device that you can plug into the HDMI port on your HD TV and enjoy most of the features you’d get with Amazon Fire TV set-top. However, Amazon Firestick doesn’t offer arcade gaming capabilities and lacks 4K video, so you can play a bit more casual games and have enough processing power for 1080p streams. Amazon Firestick features a quad-core processor, dual-band Wi-Fi, and 1080p-capable video. It has 1 GB of memory (Amazon Fire TV has 2 GB) and 8 GB of internal storage. Amazon Fire TV allows you to expand the internal storage up to 200 GB with a MicroSD card while Firestick doesn’t offer this option. VPNs encrypt your Internet connection, which keeps your sensitive data away from any prying eyes, including your ISP, hackers, and government agencies. Your ISP can monitor your online behavior and log your Internet activity indefinitely. This allows your ISP to serve you copyright infringement notices when it catches you downloading torrents. It can also hand over this data to government agencies, major corporations, and marketers. A VPN is a rock-solid barrier between you and your ISP that masks everything you do online. This is an especially important feature for streamers. If you want to access the US version of Netflix, for example, but can’t due to your geographic location, VPNs allow you to “trick” Netflix defense mechanisms into believing your Internet traffic actually comes from the US. Your VPN will change your IP address and connect to Netflix through a server in the US, which will enable you to stream its library while hiding your true IP and location. Your options are not limited to Netflix, of course. With a good VPN, you can unlock any geo-restricted content anywhere in the world. Amazon Firestick is still relatively new in terms of its compatibility with major VPN services. This is why we made sure that our list of the best VPNs for Firestick contains only services that have dedicated Fire TV VPN apps, meaning you’ll be able to access these VPNs in the apps section and simply install them on your device. You can also set up your VPN for Firestick on a compatible router. This way, you’ll protect not only your Fire TV Stick connection but also every other device that connects to that router. Note that not all routers come VPN-ready out-of-the-box. In other words, you may need a Tomato or DD-WRT based router to install your VPN. Keep in mind that not all routers are compatible with DD-WRT. If you have an ISP modem, you definitely won’t be able to install DD-WRT on it. What Makes A Good VPN For Firestick? Since Amazon Firestick is a device designed to help you stream your favorite content online and play games, it needs to be paired up with a lightning fast VPN that won’t hold you back and ruin the whole experience. Streaming and online gaming are very taxing on your Internet connection and having a VPN that’ll slow it down even further kind of defeats the whole purpose of using Firestick. We implemented our rigorous set of ranking criteria during our testing circuit and made sure to include only the premier options on our list of the best VPNs for Firestick. In order to familiarize you with the process and point out some key factors you should always keep in mind when choosing a VPN for Firestick, we’ll share some of these criteria with you. As we already mentioned, one of the most significant reasons people want to use VPNs with Amazon Firestick in the first place is to bypass geo-restrictions and unlock better streaming libraries. This cannot be done without a good server coverage that’ll allow you to connect to your chosen location no matter where you are. Bottom line, the more servers, the better. The overall server count should be in the thousands and with a good spread all across the globe. We were also very mindful of the policies of constantly adding more servers, so even if some companies on our list don’t feature thousands of servers right now, we thoroughly researched their company policies and are quite sure they’ll get there in due time. Connection speed is always important but even more so if you want to use your VPN exclusively for streaming. As we said, streaming devices consume a lot of resources, so you need a pretty fast connection if you want to stream in HD. If you want to use your Amazon Firestick for gaming, a responsive connection is also a must. Therefore, when choosing the best VPN for Firestick, you should make sure your company of choice offers unlimited speeds and bandwidth. Unlimited server switching is also a nice addition. Overcrowded servers can cause significant speed drops, which brings us back to our first point: you want to pick a VPN service with a lot of servers, which minimizes the chances of overcrowding. The primary role of any VPN is to keep you protected from any cyber dangers lurking on the Internet. They do this by encrypting your online traffic, hiding your true IP address, and serving the rest of the world with a bogus location instead of your real home address. However, bear in mind that you should never sacrifice security for speed. It is true that encryption slows down your connection, but that’s hardly noticeable with the companies on this list. If you decide to install streaming platforms like Kodi on your Amazon Firestick, you can even get into some legal problems if your VPN is not up to par. Some of the popular streaming services often use copyrighted and downright illegal streaming sources and the fines are astronomical if you get caught. VPNs with solid security configurations make sure you don’t. Bottom line, you shouldn’t go any lower than AES-256 cipher, RSA-2048 handshake, and SHA-256 authentication. AES-256 is what VPN companies refer to when talking about “military-grade” or “bank-grade” encryption. Our goal is to help you find the best VPN for Firestick that suits both your needs and your budget. What follows is a complete overview of the pricing options offered by VPN solutions that made it to our top list. Browse the table below and discover how our top picks compare to one another in terms of affordability. We have chosen the best VPN services that satisfy all of our selection criteria. Now it is time to explore our top picks in greater detail and find out which one is the best fit for you. Read the mini-reviews below, discover the key features of our top-rated VPN services for Firestick, and decide which one is the right match for your needs. ExpressVPN is a famous online security service that prioritizes fast connection speed all across its network. The company is so dedicated to this idea that we honestly couldn’t tell we were using a VPN while doing our testing for this list. ExpressVPN currently offers more than 1,500 servers in 94 countries. You can connect up to 3 devices at the same time and enjoy unlimited bandwidth, speed, and server switching as well. As we said, this VPN has little impact on your connection speed, so you shouldn’t experience sudden speed drops or any related issues. The company supports OpenVPN, SSTP, PPTP, and L2tp/IPsec connection protocols and encrypts your traffic with AES-256 cipher. It comes with a neat kill switch feature, doesn’t keep any logs, and protects you against DNS leaks. ExpressVPN doesn’t have a native Amazon Fire TV Stick app, so you have to sideload it. However, you shouldn’t have any problems with this since the official website offers a ton of instructions, including a video setup tutorial. NordVPN is a VPN provider that strikes a perfect balance between simplicity and complexity. On one hand, even absolute beginners can use it without difficulties. On the other, it’s a very powerful VPN with loads of extra features. NordVPN features 3,557 top-quality VPN servers spread across 61 countries. The company allows up to six simultaneous connections and offers unlimited bandwidth, speed, and server switching. During our testing, with didn’t notice any significant speed drops or experience disconnects. When it comes to security, NordVPN supports OpenVPN, L2TP, PPTP, and IPsec connection protocols and encrypts your traffic with AES-256 cipher. We should mention that NordVPN is the only service that encrypts your traffic twice. NordVPN is, unfortunately, not available on Amazon’s App Store, which means it doesn’t have native app support. However, the official website provides detailed instructions on installing the app manually. CyberGhost is well-known for its wide platform support, bulletproof privacy & security features, unlimited traffic/bandwidth, and dedicated streaming servers. The company was founded back in 2001 in Romania as a simple unblocking software before reaching its current development. When it comes to Firestick, CyberGhost features a dedicated app for the Fire OS (which is basically a modified Android OS) and allows you to equip your device with a fully-fledged VPN functionality, including IP anonymization, safe transactions, streaming, and more. Note that you should download the app from Amazon’s App Store and provide a valid email to initiate the trial period. After the trial is over, you WILL have to purchase a subscription if you want to continue using the service. CyberGhost will encrypt your traffic with AES-256 cipher and let you choose between OpenVPN, PPTP, L2TP, and IPSec. It also comes with an automatic killswitch, DNS and IP leak protection, a strict no-logging policy, and a 45-day money-back guarantee. The company operates more than 3,500 servers in 57 countries and the software supports up to 7 simultaneous connections. Similarly to ExpressVPN, PureVPN puts a huge emphasis on lightning fast streaming capabilities. It offers a dedicated app for Amazon Firestick, which received its latest update on February 6, 2018. PureVPN offers more than 750 servers across 140+ countries, which guarantees excellent geographic coverage. It allows up to five simultaneous connections and offers unlimited speed, bandwidth, and server switching. As for security, it supports OpenVPN, PPTP, SSTP, L2TP/IPsec, and IKEv2 and uses 256-bit data encryption to scramble your online traffic. The company keeps no traffic logs and features an auto kill switch. It also offers more than 88,000 shared IP addresses, which guarantees the highest level of online anonymity. For streaming purposes, you can purchase a dedicated IP add-on that’ll make it harder for Amazon and Netflix to blacklist your VPN traffic. Installing PureVPN on your Firestick is quite effortless thanks to the dedicated Firestick app, but if you have any problems, you can find a detailed manual (with pictures) on the official PureVPN website. IPVanish is a great option for all Amazon Firestick users out there. The installation is beyond simple since the company features a native app on the Amazon App Store. You should note that IPVanish app doesn’t support first-generation Firestick. IPVanish currently offers more than 1,000 VPN servers spread across 60+ countries. You can connect up to five devices at the same time and the company also features unlimited bandwidth, speed, and server switching. IPVanish supports OpenVPN, PPTP, and L2TP/IPsec connection protocols and uses AES-256 cipher to encrypt your traffic. It has a zero-log policy, features a kill switch, and protects you from DNS leaks. It offers only shared IP addresses at the moment, though. The fact that it keeps absolutely zero logs offsets the concerns that might arise from the fact that IPVanish is registered in the US. Without any logs, however, the company has no sensitive data to hand over even if served a warrant.